Citation Information: JCI Insight. 2018;3(23):e122450. https://doi.org/10.1172/jci.insight.122450. Symptomatic distal sensory polyneuropathy (sDSP) is common and debilitating in people with HIV/AIDS, leading to neuropathic pain, although the condition’s cause is unknown. To investigate biomarkers and associated pathogenic mechanisms for sDSP, we examined plasma miRNA profiles in HIV/AIDS patients with sDSP or without sDSP in 2 independent cohorts together with assessing related pathogenic effects. Several miRNAs were found to be increased in the Discovery Cohort (sDSP, n = 29; non-DSP, n = 40) by array analyses and were increased in patients with sDSP compared with patients without sDSP. miR–455-3p displayed a 12-fold median increase in the sDSP group, which was confirmed by machine learning analyses and verified by reverse transcription PCR. In the Validation Cohort (sDSP n = 16, non-DSP n = 20, healthy controls n = 15), significant upregulation of miR–455-3p was also observed in the sDSP group. Bioinformatics revealed that miR–455-3p targeted multiple host genes implicated in peripheral nerve maintenance, including nerve growth factor (NGF) and related genes. Transfection of cultured human dorsal root ganglia with miR–455-3p showed a concentration-dependent reduction in neuronal β-III tubulin expression. Human neurons transfected with miR–455-3p demonstrated reduced neurite outgrowth and NGF expression that was reversed by anti–miR–455-3p antagomir cotreatment. miR–455-3p represents a potential biomarker for HIV-associated sDSP and might also exert pathogenic effects leading to sDSP. Differentially expressed miRNAs in the Discovery Cohort. Analysis of upregulated and downregulated miRNAs analyzed by GeneSpring analyses in sDSP (n = 29) compared with non-DSP (n = 40) patients in the Discovery Cohort. (A) Hierarchical cluster. 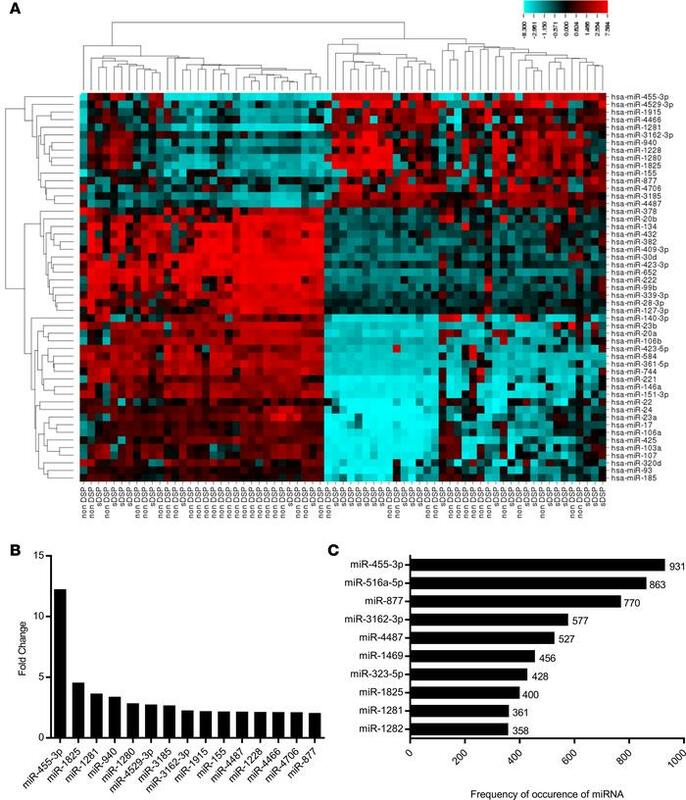 The heat map clusters and distinguishes the upregulated (top 15 miRNAs) and downregulated (bottom 36 miRNAs) miRNA profile substantially and as shown by the grouping and clustering of the side dendrograms (left). The heat map also clusters the patients into sDSP and non-DSP, as shown by the 2 groups in the top dendrogram. (B) Histogram of upregulated miRNAs. The median of each probe set in the sDSP or non-DSP patients was calculated and the significance of any differences determined by Mann-Whitney U test. The 15 upregulated miRNAs with a fold change of greater than or equal to 2 and a P value less than or equal to 0.05 in the array hybridization were selected. (C) Random Forest Analysis shows the top 10 miRNAs with the highest frequency of miRNA occurrence based on P value (P < 0.05) and 2-tailed sample t test.